Take your camcorder underwater to film beautiful coral fish or make an exciting film of your rafting trip. The problems associated with such adventures are readily appreciated but quickly overcome with an Ewa-Marine video housing. Each housing is individually tested for use to a depth of 10m (33 ft). Remarkably light and still robust, they provide effective protection against sand, dust, rain, seawater , mud, humidity as well as all other adverse conditions. The VST is manufactured from double laminated PVC and has an optical glass port. It is rated to 10 meters (30 ft) underwater. It has a pair of non-corrosive and seawater resistant clamping rails which fit together for perfect sealing. They tighten by means of knurled thumbscrew knobs. 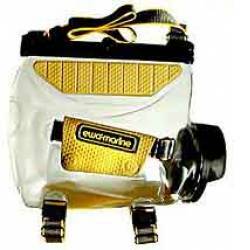 It is supplied in a handy yellow carry-case which has a waterproof interior and zippered side-pocket.